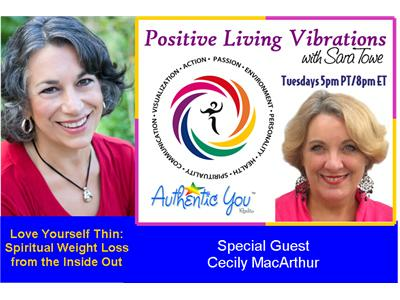 Love Yourself Thin: Spiritual Weight Loss From the Inside Out with Cecily MacArthur. In loving yourself from the inside out you have a positive effect on your body in and out. Look Fabulous by feeling Fabulous with Spiritual Weight loss. Cecily MacArthur is a world-class “Dream Life Coach,” a Transformation Specialist, and a Spiritual Weight Loss Mentor. She is a powerful intuitive, a certified Life Coach and Life Mastery Consultant, and an experienced spiritual teacher and author in the human potential movement. She helps you connect with Spirit to awaken your authentic self, discover your true purpose, and create the life of your dreams. Cecily is also the author of the book “7 Ways to Stay Positive in Challenging Times,” regularly conducts teleseminars on dream building and spiritual development, hosts a monthly interview show called the “The Light Beam Hour”, and has co-hosted 4 successful telesummits on Angels, the Law of Attraction, Energy Healing, and the Chakra System. Her background includes 20+ years as a corporate organizational and management consultant, trainer, and coach, and a life-long commitment to her own spiritual growth.